Davidson, NC– Home of Davidson College which has one of the best small college basketball programs in the country. It is a picturesque college town with beautiful oak trees that canopy the campus and streets presenting a cozy and sheltered feeling. 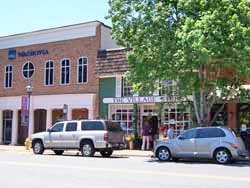 Davidson is a small college town (Davidson College) located between Mooresville and Cornelius, NC. Exit #30 on Interstate 77 north to Davidson is 20 miles from “Up Town” Charlotte.